The Importance of Stretching at Work | Horizon Technology Partners, Inc.
It’s no secret that sitting for extended periods of time can have a negative effect on our bodies. If you’re like most people you sit at your desk all day long resisting the urge to get up and walk around because you feel you need to stay focused on your work. You’ve trapped yourself in your office or cube because you believe it will increase your productivity. However, longer stretches of time at your desk don’t necessarily mean higher quality or quantity of work. If you want to be more productive and you want to feel better, take a few breaks during the day. Get up, get away from your desk and stretch out. It can be extremely beneficial to take a few minute break every hour or so to stretch your muscles. This can be a great way to clear your head and can also prevent fatigue of the body and mind. You may be hesitant to step away from your work, but here are some great reasons to get up and add some stretches to your day to day routine. Mood Enhancer – When our muscles aren’t moving we’re not getting as much blood and oxygen to our brain, the lack of oxygen can leave you feeling groggy and typically means there are fewer mood enhancing chemicals being released in your brain. Stretching gets your blood flowing and can keep those mood enhancing chemicals pumping. Simply take a few minutes to stretch out of every hour can significantly lower your stress levels. Improved Circulation – Like I said, stretching gets your blood flowing. Your body’s blood circulation is a very important part of your overall health. An increase in circulation can help to benefit your heart, muscles and arteries. Increased circulation means an increase in body temperature and that can be really helpful during these cold winter months. A lower body temp can make your feel tired and hungry, two factors that contribute to winter weight gain. Better Posture – Sitting for hours at a time can cause damage to the natural curvature of the spine. If you’re feeling back or shoulder pain throughout the day a few stretches will help relieve that tension. By consistently stretching your back muscles, good posture will slowly become more natural to you. Increased Productivity – Although at first it may seem counterintuitive to take a break to improve your workflow and productivity, taking 10 minutes every hour can help you shed off some of your stress, get your blood pumping, and allow you to come back to your work with a clear mind. Short breaks away from your desk can actually make you more productive. 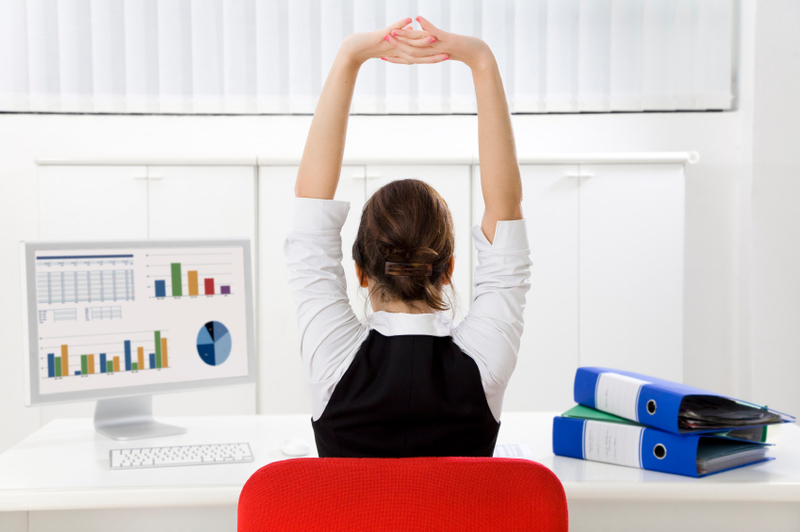 Here’s a great list of the top ten stretches for office users with pictures included. The stretches include the chest stretch, shoulder shrugs, upper back stretch, spinal twist, torso stretch, forearm stretch, neck stretch, hip flexor stretch, seated hip stretch, and inner thigh stretch.